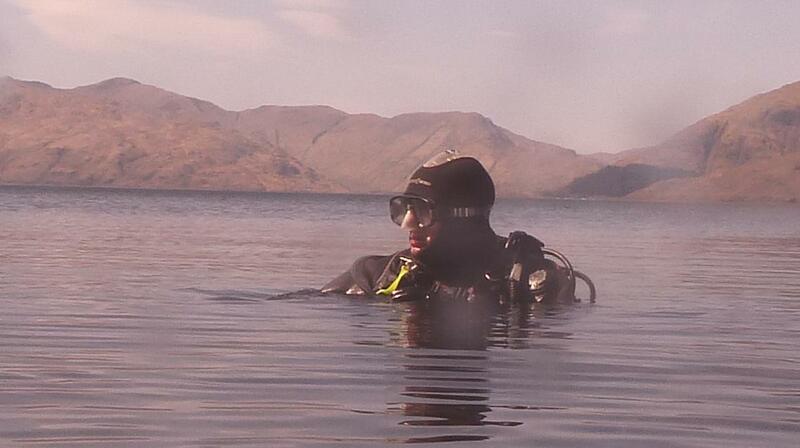 A small team enjoyed the delight of the continuing good weather and went shore diving on Loch Linnhe on Sunday. Meeting at the Holly Tree Inn car park , Kintallen for 09:00 am was a test but the team mustered on time and was in the water before 10:00 having walked the site and done a dive briefing. What a difference bright light and good vis makes. The wall, seen previously within the confined of a torch beam, was perhaps less impressive. The bottom was flat at 33m (low tide) where silt and stones disappeared off into the middle of the loch. The wall was not quite as festooned with life as previously though a string of lost crab pots near the end were covered in seasquirts, sea oranges and peacock worms that snapped back into their pipes in waves as we approached. With No Stop time exhausted and a decompression stop indicated it was time to ascend and start the underwater fin back to the pier. Just at the top of the slabs a couple of little nudibranchs (Favorinus blianus) created interest before heading in, completing our decompression as we did so. After lunch, rather than replay the mornings dive we decided to do something different and set off down towards Appin and the Shuna Layby dive site. 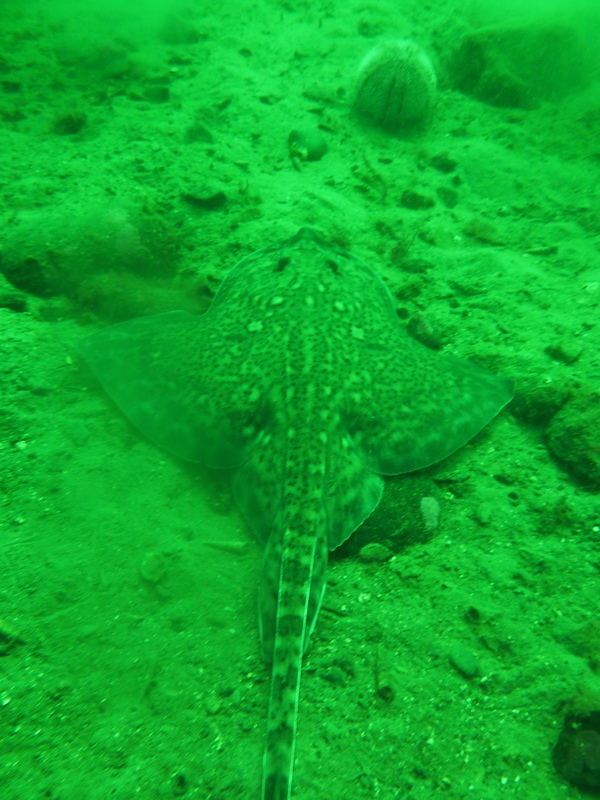 Lunch was taken on the remnants of an old concrete breakwater and as the weekends batch of kayakers set off for their tour of Shuna we kitted up for the second dive. 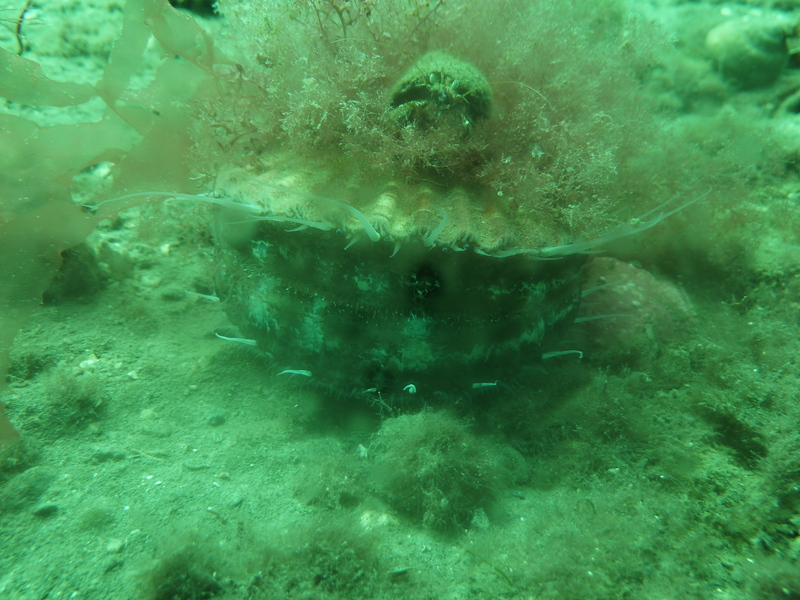 This site was a pot luck affair and while the initial sand hosted flights of Queen scallops it rapidly gave way to mud. 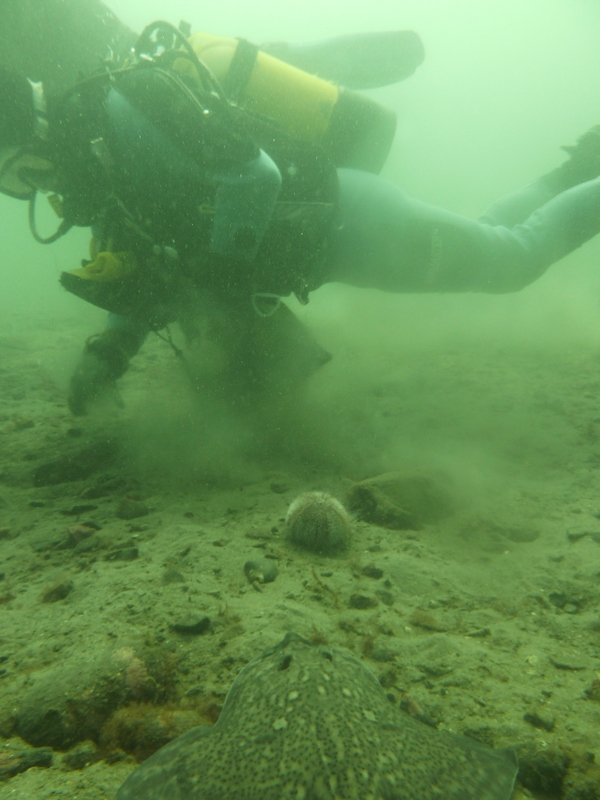 In a field of sea pens we turned around and started back picking up a couple of large scallops against the rocks where the dredgers were unable to apply their destructive powers. And that was it, another good day out with the club, fantastic weather and new sites.